Mike Todd, Taylor's third husband, gave her the set of ruby and diamond jewels in 1957 while the couple were on holiday in France with friends (including Todd's best friend, Eddie Fisher, who Taylor would marry after Todd's tragic death). "They had been renting a chateau in the south of France, and Elizabeth ... had been swimming in the pool, doing laps, wearing the Mike Todd Tiara," a Christie's spokesman explains, "when Mike Todd arrived carrying red boxes. And we all know what red boxes mean: Cartier." "There wasn't a mirror around, so Elizabeth used the reflection of the pool to see herself" wearing the new ruby and diamond suite." Home movie cameras captured the moment that Todd presented Taylor with the jewels. The bib necklace alone absolutely demolished its pre-auction estimate of $200,000-$300,000, selling for an astonishing $3,778,500. 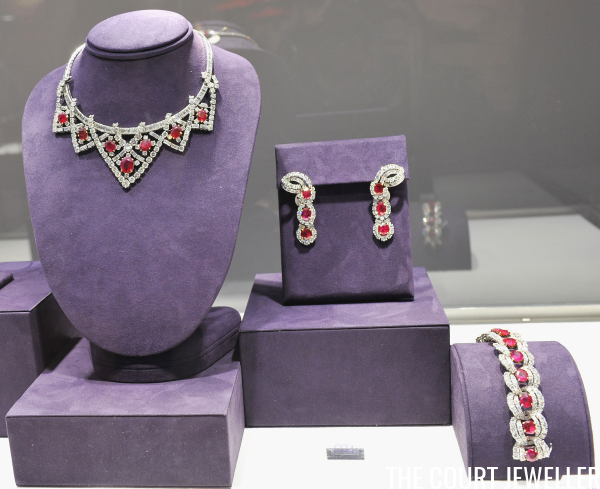 The earrings from the set fetched $782,500, while the bracelet sold for $842,500. In this image, Todd fastens the necklace around his wife's neck, while Taylor puts on the earrings. Note the trademark Cartier red box casually wedged under Todd's arm!